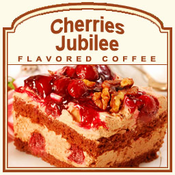 Savor the essence of cherry brandy, dark red rich cherries and the flavor of smooth vanilla cream over freshly roasted Arabica bean gourmet coffee in our Cherries Jubilee flavored coffee. Surrender to the rich sweet cherry flavor of Cherries Jubilee and free yourself from the ordinary and try something extraordinary! We specialize in flavored coffee, as each one is our Roastmasters own work of art that he is prepared to share with you. Buy Cherries Jubilee today and savor the one of a kind taste! A heat-sealed valve bag will ensure the freshest coffee which will be fresh roasted the day it ships. Enjoy!